If you are looking for ways to save on your energy bill, don’t neglect the duct work. Duct work can be one of the reasons why a heating and cooling system has trouble heating and cooling the home. Since it is located in hidden areas that are difficult to see, detecting problems isn’t easy unless you closely examine they duct system and know what to look for. If your duct work is leaking or allowing treated air to escape, your HVAC system is going to have trouble maintaining the desired air temperature and your utility bill will be higher than it should be. A grimy duct system can also hike up your utility bill. Duct work can have problems, especially at connections where it can come loose. Animals can chew through or there may have been bad workmanship during the initial installation. Having your duct work inspected and repaired where necessary will help your HVAC system to more easily draw and disperse the air. It will be able to function properly. In effect, your utility bill will be lower. When installing duct work, the system should be properly sealed at all connections and wrapped with insulation that is also sealed so no air escapes at all. The HVAC system is supposed to be a closed system, meaning no leaking air, in order to draw and disperse air. When installed or repaired correctly, you’ll be getting the use of all the cooled or heated air instead of having it escape through cracks or holes. Ducts that are sealed and insulated also keep dirty air from getting into the system. This means you’ll also have a better indoor air quality because the air will not constantly be exposed to environmental conditions. Having the ducts cleaned isn’t just for better indoor air quality but can also assist your HVAC system in operating without stress. 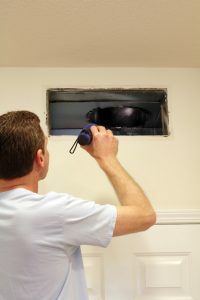 When the duct work is cleaned, important parts of the HVAC system are also cleaned. With grime build-up, the machinery labors to perform. This causes early replacement, more repairs due to breakdowns, and a higher energy bill. Duct cleaning should be done as often as you want it to be done. How often is necessary will depend on the environmental air quality of where you live, how much vehicle traffic is near your home, and a score of other variables. In general, they do well with a yearly cleaning. You can tell that you need duct cleaning if there are dark stains around the duct vents leading into your home. Blackened soot will form at a certain late stage. If you see the stains, it’s way past time to have your duct work cleaned. DeZiel Heating & A/C offers exceptional duct work installation, repair, and cleaning service in Buffalo and surrounding communities. We also provide vent work and gas line services. Give us a call because we can help you get your HVAC system in good shape so you can save on your energy, repair, and replacement costs this year and for years to come. If you have questions or need Duct Work services in West Metro, Wright County, or Buffalo, please call 763-684-3965 or complete our online request form.